A Skymax 127 was mounted on a Celestron AVX, EQ, GOTO mount. 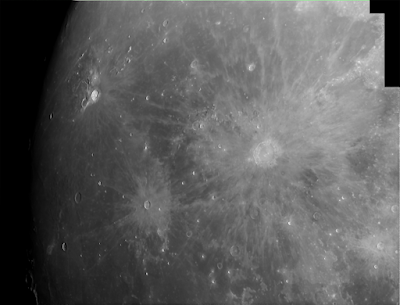 A SVBONY SV105 camera was placed at the Cassegrain focus and two overlapping areas of the 97% waxing Moon were imaged with AstroDMx Capture for Linux as 1500 frame unsaturated SER files. The best 50% of the frames in the SER files were stacked in Autostakkert!, stitched together with Microsoft ICE and wavelet processed in Registax 5.1, all running in Wine. The final image was post processed in RawTherapee and the Gimp 2.10.